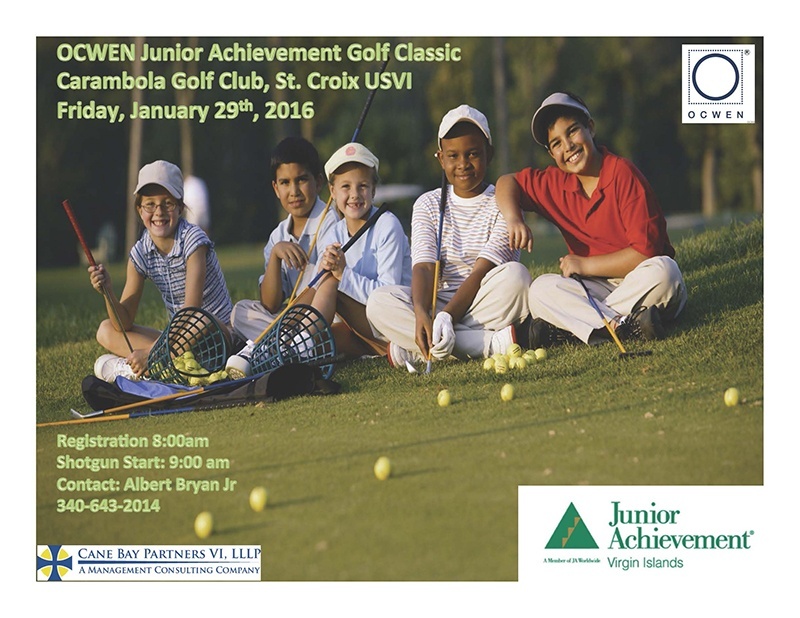 Christiansted, USVI – Cane Bay Partners VI, LLLP is proud to announce its sponsorship of the OCWEN Junior Achievement Golf Classic, which Cane Bay Partners Co-CEO Kirk Chewning will participate in this Friday, Feb. 29 at Carambola Golf Club on St. Croix. Chewning also serves as vice chair of the Junior Achievement Virgin Islands Board. The 18-hole tournament begins at 9 a.m. Friday morning, and a luncheon and awards ceremony will kick off at 12:30 p.m. There will be 18, four-member, randomly placed teams. There will be first, second and third place awards for both gross score and net score. Finalists will receive custom trophies by Mitchell Larsen Studios, and other participants have a chance of winning gift cards for an online golf store and local handmade jewelry. There also is a $15,000 cash prize for a hole-in-one. The tournament was conceived by Chewning and Patrick Cox, of OCWEN, also a member of the Junior Achievement VI Board. The event coincides with OCWEN’s annual legal conference, which brings 40 to 50 attorneys and their support staff to St. Croix, according to JAUSVI Executive Director Albert Bryan. Bryan hopes the event will serve as a networking event for stateside and local business people. “We are eternally grateful to board members Patrick Cox and Kirk Chewning for making this event a reality. A perfect example of how our EDC companies can leverage their relationships to provide charitable dollars for non-profits like ours. These funds will go a long way toward expanding our programs in the Virgin Islands,” Bryan said. The primary goals of the event are to increase awareness of the local Junior Achievement program among potential corporate sponsors, and to raise funds to support an expansion of the program, according to Bryan. Bryan hopes this and other fundraising efforts will result in an increase of students impacted by Junior Achievement from 7 to 20 percent of the local school population.